Whether you’re an experienced player or new to the game – welcome! Croquet is a fascinating game that combines skill and tactics, as well as a strong element of sociability, and can be played by all ages and sexes, on equal terms. We welcome players of all standards and levels of experience. Our members range from international players to those who primarily enjoy the recreational and social side of the game. 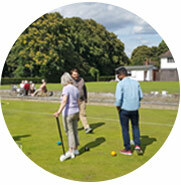 Ealing Croquet Club is set in attractive surroundings in Lammas Park, with three flat, fast-paced lawns that are amongst the finest in the country. Croquet has been played there, albeit not continuously, since the early years of the twentieth century. You can read more about the formation of the club in our History of ECC on the News page. Croquet is played primarily in the summer, but the club is open throughout the year (flood or blizzard permitting). Croquet players are always keen to encourage those who are new to the game. You may find there’s a top player on an adjacent lawn who is happy to give you a few tips. If you’d like to give croquet a go, there are lots of ways to get started. You’re very welcome to just come along to one of our Club Nights, every Thursday evening during the summer from 6pm until dusk, or to a Club Day, every Sunday afternoon from 2pm to 5pm. Alternatively, you can call Ruth Sisley on 07890 465 685, who will be happy to arrange for a member to meet you and show you the ropes. All you need to bring is a pair of flat-soled shoes – we’ll provide everything else. There are two main variations of the game – Golf Croquet and Association Croquet. Golf Croquet games are quicker and involve more interaction, whilst Association Croquet games are generally longer, and involve a wider variety of different strokes. 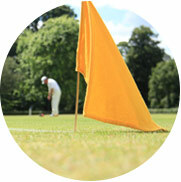 You can find out more about Golf Croquet here and more about Association Croquet here. For more information, individual lawn status and to book, login to the Member&apos;s Area. 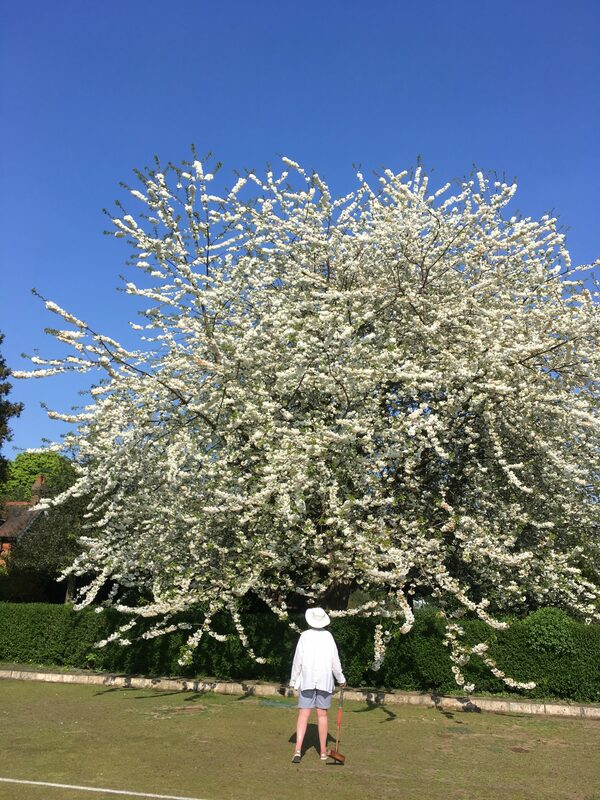 Whilst your opponent is going round, you can always enjoy the magnificent blossom next to Lawn 1. Can he? Yes he Duncan.